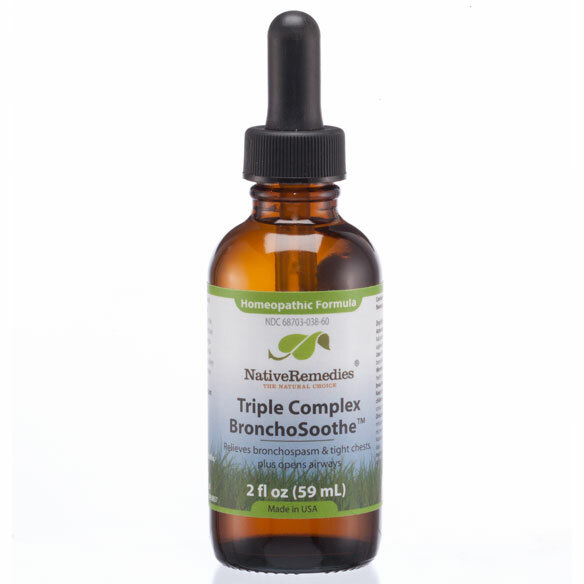 Triple Complex BronchoSoothe is a safe, non-addictive, natural remedy containing 100% homeopathic ingredients especially selected to temporarily relieve tightening of the chest to open airways and temporarily improve respiratory health. Triple Complex BronchoSoothe is a combination of three biochemic cellular-supporting tissue salts and may be taken at the first signs of wheezing, chest constriction, closed airways or abnormal breathing for effective help. Triple Complex BronchoSoothe is taken internally to temporarily support lung and bronchiole functioning, and maintain respiratory tract and immune system health. Available in convenient liquid form, Triple Complex BronchoSoothe is easy to ingest and hassle-free with no artificial colors or preservatives. 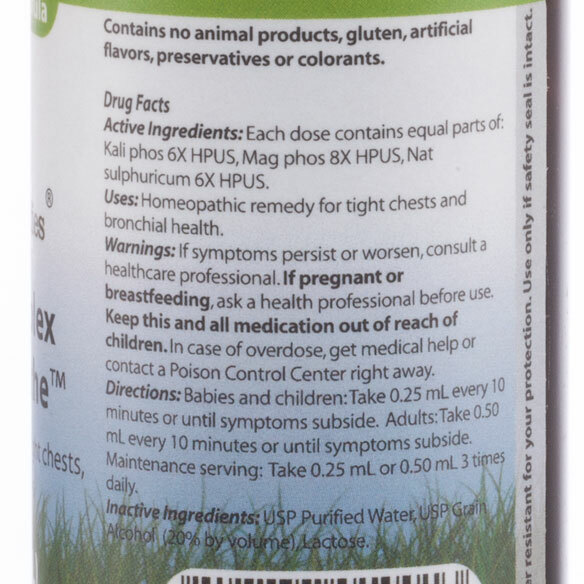 Triple Complex BronchoSoothe is 100% homeopathic, contains these ingredients, and has the following indications (purposes): Kali phos 6X HPUS, Mag phos 8X HPUS, and Nat sulphuricum 6X HPUS. Kali phos 6X HPUS: found in the blood and is an essential constituent of hemoglobin which carries oxygen to all parts of the body; loss of voice from straining vocal cords, dizziness and fainting from mild exertion. Mag phos 8X HPUS: found in the blood and is an essential constituent of hemoglobin which carries oxygen to all parts of the body; antispasmodic, neuralgic pains with spasmodic, muscular contractions, cramps, spasmodic coughing and heart palpitations. Nat sulphuricum 6X HPUS: found in the blood and is an essential constituent of hemoglobin which carries oxygen to all parts of the body; difficulty breathing in damp weather, water retention and edema. Babies and children: Take 0.25 mL every 10 minutes or until symptoms subside. Adults: Take 0.50 mL every 10 minutes or until symptoms subside. Maintenance serving: Take 0.25 mL or 0.50 mL 3 times daily. 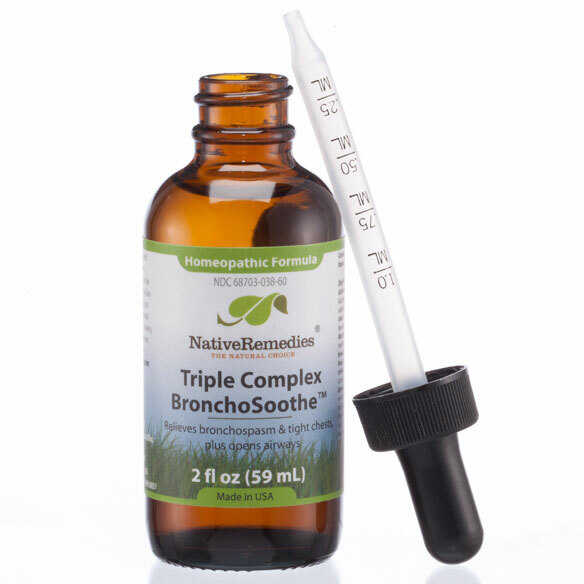 Triple Complex BronchoSoothe is a homeopathic remedy and is safe for all ages. There are no known drug interactions. One 59 mL bottle of Triple Complex BronchoSoothe will last approximately 39-40 days, depending upon the amount taken and the frequency of use. I have a dog that takes drops for his lungs, coughing and difficulty breathing. I wanted to try this for him to see if it improves his condition.